That is, without these outré, ridiculously violent intervals, the story could not feasibly develop any more plausibly than the story of the Titanic with the ship and ocean replaced with a Morris Minor and rush-hour traffic. The character-development (the core of any good story) would make no sense. Did I enjoy these shooter portions of the game? No, not really. While I was playing through the story, they felt like impositions – random chunks of gaming thrown into an otherwise well-crafted interactive story. Only as I sat through the credits (do sit through the credits. Right through. There’s a final playable scene at the very end) turning over the structure and emotion of the story in my mind, did it occur to me how much diminished the final work would have been without these pieces. Yes, a story could have been told without them, but it couldn’t have been the same story. 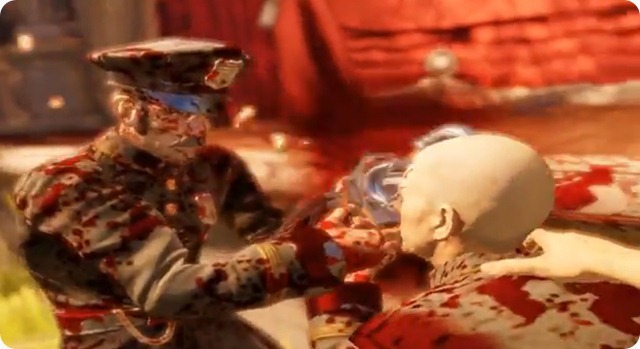 Booker DeWitt – into whose shoes we step for the course of this story – is a man with a terrible past. He has done terrible things in his life, some for good reasons, some for … well, not so much. Having done what he has done, he has made his choices about how to deal with his past. Choices you may or may not agree with as you learn more about them. The discovery of DeWitt’s past by you, the player, as well as by others is a part of the story. The story opens in 1912 as DeWitt is rowed out to a lighthouse off the coast of Maine, by an unusual pair who seem to hardly treat him as a person. “Bring us the girl and wipe away the debt,” is his raison d’etre. The girl is called Elizabeth and is in a place called Monument Island. DeWitt must find her and bring her back to New York. DeWitt is clearly being manipulated along a path, but it is also clear that he is not aware of the extent or nature of that path. From a lonely lighthouse off the coast of Maine, DeWitt is catapulted (almost literally) into a floating sky-city of which he has never heard, the city of Columbia. As the city rearranges itself, connecting and reconnecting in different configurations, DeWitt must find the piece called Monument Island, make his way there, and find the girl, Elizabeth. DeWitt’s character is a vocal one. He speaks aloud, and interacts vocally with others, as well as making various observations and imprecations for his own benefit. In that, the character is more realised and more engaging than voiceless or mute protagonists like Half-Life’s Gordon Freeman or Dishonoured’s Corvo Attano. 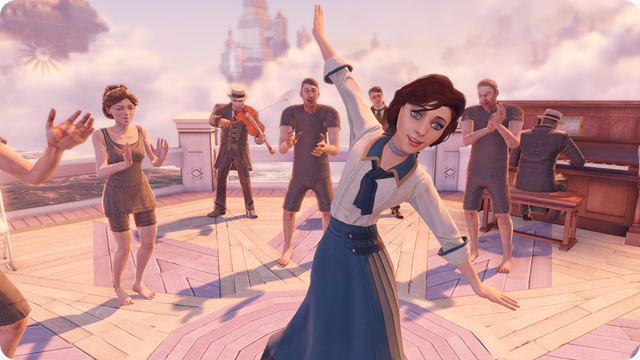 Both DeWitt and the girl, Elizabeth, are excellently voiced, and that brings a lot of power to the story-telling, particularly to Elizabeth’s Disney-Princess moments during her introductory scenes. Elizabeth makes for a useful and interesting partner, adding her own observations at times, and offering various types of aid in combat. Now, all good stories are about people, rather than about events. Events are the tool which shape and show people, and conflict is the most basic tool in the toolbox when it comes to character development. This brings us back to violence. DeWitt and Elizabeth are opposed – violently – at almost every turn. DeWitt gets to see a little of the sky-city in peace, before its dark-side suddenly and frighteningly explodes in blood and bone-fragments, havoc, flame, smoke and murder, with himself as its locus. In many ways, I’d think twice about showing much of this game to others. As a shooter, these portions are competently and confidently executed, gamey set-pieces. The level of violence and gore was rather horrifying (relative to the rest of the subject matter), however on reflection that’s how it needs to be to tell the story that it tells. If it were not, in some ways, distasteful to you, the story would have less emotional impact on you, the player. It is this terrible conflict between Columbia’s factions, and between DeWitt and the human (and not-so-human) obstacles in his path that will shape DeWitt and Elizabeth, shock them, enlighten them, disappoint them, strengthen them and change them. How and when and why this happens is the very core of the story. As the story progresses, clues, events and foreshadowings emerge, which may lead the more insightful player to expect events and reveals which come as a surprise for DeWitt. The recurring characters of Rosalind and Robert Lutece inform the overall narrative in both subtle and overt ways with their idiosyncratic byplay that is so very reminiscent of Rosencrantz and Guildenstern Are Dead. By the time the story has “given you the finger” (so to speak), you’ve already had enough foreshadowing and clues that you could put the final surprise together – but it is okay if you don’t, too. There’s a lot going on. 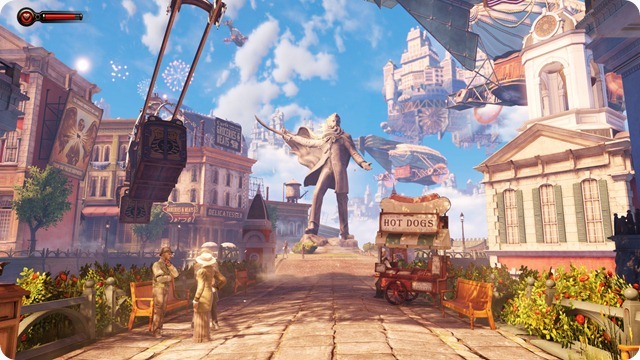 In other respects, Bioshock Infinite’s construction is competent, and almost pedestrian. As a player, you are more or less forced on a path, which might involve only a very little back-tracking (where permitted), and often closed off from returning along your path for any length unless there’s some design reason requiring it. A lot of the flavour of the city of Columbia, its life and times, is in its artwork (distinctive) and its music (excellent, and often deliciously anachronistic), as well as the collectible audio-recordings which hearken all the way back to Looking Glass Studio’s System Shock. As is usual, certain critical pieces of action take place behind impenetrable barriers to prevent the player from disrupting certain set-pieces. Overall, the game length is between 15 and 20 hours or so, depending on your play style, and it performed magnificently on my Windows 7 PC system. My understanding is that the PC is the superior platform for the game, playing better and looking better than its console counterparts. Audio is clear and crisp for the most part, but subtitles are occasionally useful when there’s a lot of audio happening. Now that we’ve gotten to the bottom of this piece, what’s the final verdict? I had fun playing this game – mostly. Although, to me, it was more the kind of fun you have watching a horror film. 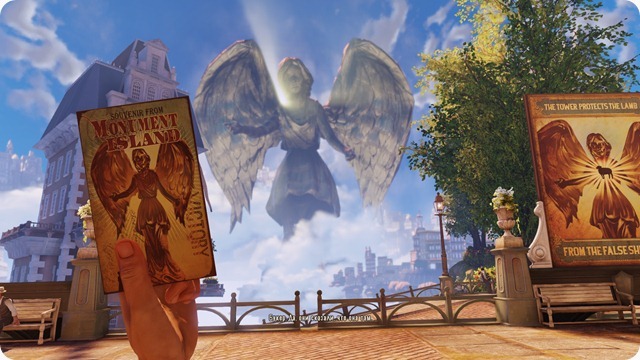 Bioshock Infinite reaches further than its predecessors, and mostly succeeds. 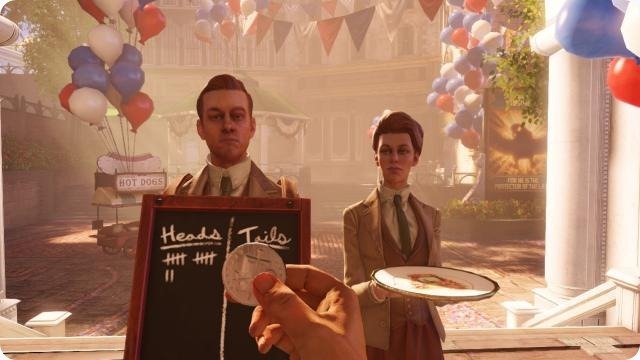 It’s not revolutionary, but it is a step forward, with a strong story and storytelling, and solid character arcs for DeWitt and Elizabeth – but look after your trigger-finger, because you’re going to need that a whole heck of a lot, even on the Easy difficulty setting. Bonuses: No Quick-Time-Events, no real boss fights to speak of. Both big plusses in my book. Difficulty seems to remain relatively constant throughout, though there is a more complex battle near the end which will certainly keep you hopping. 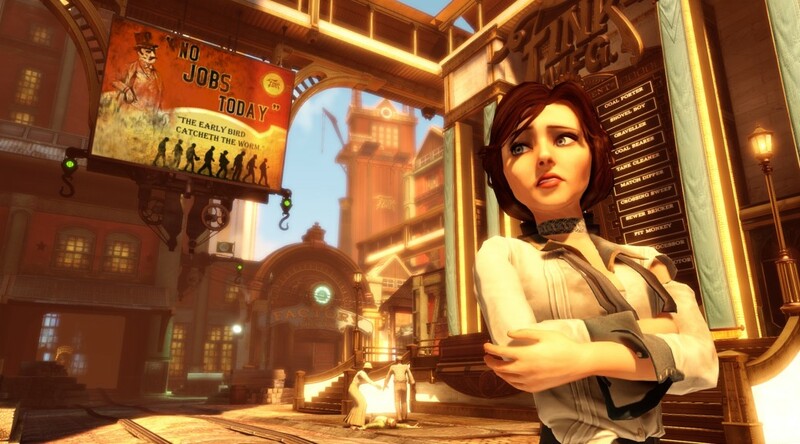 If you mostly liked Bioshock 1, then this game should offer you a good time. If you’re still on the fence about the game, I’d recommend waiting for one of the inevitable sales.